This marathon is called the List of Shame because it includes movies I'm embarrassed to have missed so far. However, this term could also apply to a certain once-beloved filmmaker. 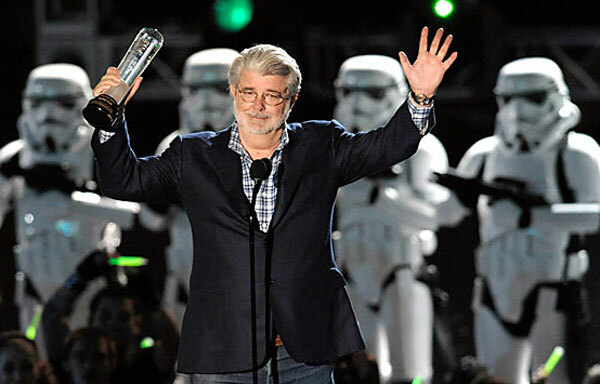 Over the history of movies, few individuals have disappointed their ardent fans more than George Lucas. He reached the pinnacle of success with Star Wars and created an empire, but something was lost in the process. His wealth and power is immense, but his name has become a joke for many fans. This denigration is chronicled in The People vs. George Lucas, an enjoyable look at his fall from grace. Ranking the greatest disappointments from Lucas' career is very easy, and this list could expand well beyond this small number. You could almost take a scene-by-scene look at the prequels to identify all the issues. I'm sticking with the creative decisions that still inspire the most anger for me. I grew up with the original trilogy and even saw The Empire Strikes Back and Return of the Jedi in the theaters as a very young kid. Lucas could do no wrong for a long time, which makes his downfall even more disheartening. I'd love to hear your choices for the biggest disappointments from the bloated filmmaker in the comments section. Let's check out the picks! Lucas didn't direct the fourth Indiana Jones film, but he worked on the story and played a key role. Released in 2008, this strangely inconsistent film is a mishmash of scenes thrown into a jumbled story. It's not a complete failure, but the tone is off, and that's exemplified in some ridiculous scenes. The most infamous is the "nuke the fridge" sequence, where Jones hides in a fridge from a nuclear bomb test. There's also the ineffective finale, which isn't just a failure because it contains aliens. Steven Spielberg deserves part of the blame, but this movie has Lucas' fingerprints all over it. The action scenes stray too much from reality, and the overall plot loses the charm of the franchise's earlier films. I feel sorry for Jake Lloyd. The expectations for the actor playing young Anakin Skywalker were off the charts. No one could live up to fans' hopes for this character. They were ready to judge him like the Jedi Council in the picture above and found him unworthy. Lloyd was flat, but the real issue was Lucas' writing and direction. He left the boy out in the cold and made him utter stupid lines like "weeeeee!" during the final battle. This was the most important character in the entire movie, and Lucas completely blew it and turned him into the most generic kid imaginable. Sure the Pod Race is fun, but watching him try to actually perform with Natalie Portman and Ewan McGregor is a painful experience. This is an obvious choice, but it has to be in this list. Trying so hard to match his success with R2D2 and C3PO in the originals, Lucas created the irritating, unnecessary Jar Jar Binks. The blatant attempts to create laughs feel desperate and beneath even the silly moments from the earlier movies. Enamored with the idea of creating a computer-generated main character, he failed to realize the mistake. It's painful to watch Liam Neeson struggle to give a believable performance next to this silly character. I know it's an obvious move to criticize Jar Jar, but he only gets worse on repeated viewings. Once you realize that the overly complicated plot isn't necessary, other missteps like Jar Jar stand out even more. 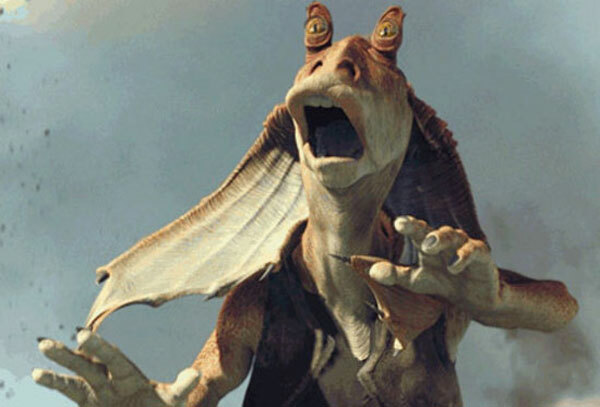 The character barely appears in the sequels, but Lucas still uses him to take a shot at his detractors by having Jar Jar play a role in the rise of the Emperor. It's an awkward move that decimates a possibly convincing moment in the series. 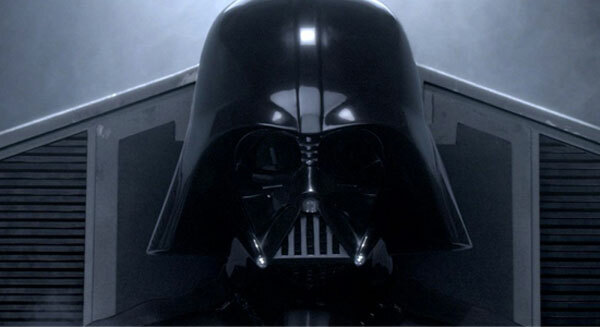 In the original trilogy, Lucas introduced the Force, a power that "surrounds and us and penetrates us. It binds the galaxy together." While this idea was fairly hokey, it worked because there was no clear explanation. In The Phantom Menace, Lucas decided that mystery was for losers and quantified the Force's effect on each person. The midi-cholorians are microscopic life forms that lives inside people and allows them to detect the Force. Why was this necessary? Few people exited the theater after seeing Star Wars and asked "How does the Force work?" It was a moot point, and attempting to explain it just highlights the craziness of the entire creation. Less is more, George. Considering the three prequels apart from their source, the closest one to an actual good movie was The Revenge of the Sith. Anakin's move to the Dark Side happens too quickly, but there are some effective sequences. The final battle with Obi-wan Kenobi works and leads up to the big reveal of Anakin in the Darth Vader suit. Sadly, Lucas ruins the scene by having him yell a ridiculous "NOOOOOOOOOOO" and throw his hands in the air. It's such a stupid moment that it kills the momentum of the entire movie. On a related note, he also added similar audio (though less bombastic) to the final battle between Vader and the Emperor in Return of the Jedi for the Blu-ray release. Once again, the change takes us out of the scene, especially since it wasn't there in our memories. Thus far, I've only briefly discussed the biggest crime from George Lucas throughout his career. The prequels were disappointing, but at least they were a new creation in the Star Wars universe. His tinkering with the original trilogy is a much larger offense. Fans flocked to the theaters when remastered versions appeared in theaters, and the promise of new effects was exciting. The modern technology seemed a bit out of place, but it didn't make a huge difference. On the other hand, changing story elements made no sense. The extra conversation with the CGI Jabba the Hutt was unnecessary, but that wasn't the worst part. 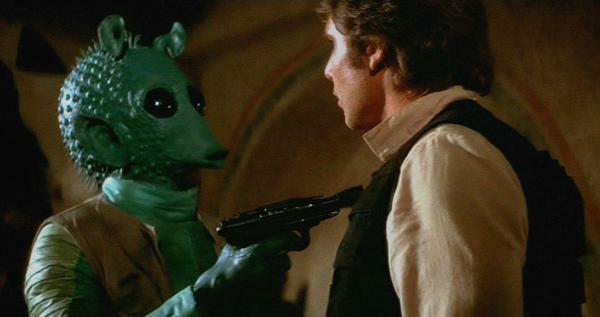 One of the classic scenes from Star Wars was Han Solo's confrontation with the bounty hunter Greedo. Realizing the danger, Han shoots Greedo without a second thought, and it sets up his character perfectly. For the re-releases, Lucas added a silly laser and made Greedo shoot first. It's ridiculous that he'd miss from two feet away, but that's only a small part of it. The worst is the adjustment to Han's character, who loses the edge that made him so likable. It also insults the fans who grew up loving the movie. Shame on you, George. Next week, I'll join the Delta fraternity and check out National Lampoon's Animal House. I'm a similar age to you. I also saw episodes 5 and 6 in the theater. While I enjoyed all three movies, I have never considered them anything more than really fun sci-fi movies. I have never considered them "great." With that in mind, I have not been bothered by the prequels as much as most other folks. Oh sure, I think that the original trilogy is superior to the prequels, but I don't think the gap between them is as large as most people make it out to be. I agree on the whole Young Anakin, both casting and writing. While I was mildly annoyed with Jar Jar Binks, I saw him as an obvious attempt to humorously appeal to kids just like R2D2 and C3PO and I was now too old to appreciate it. I notice you mentioned them, too. Most people do not even draw the parallel. If you go back and watch the original trilogy as if seeing it for the first time as an adult, C3PO is pretty damn stupid, too. As a kid, though, he was very funny, and these impressions stick with us into adulthood. I wasn't bothered by the midi-chlorians; I just thought they were pointless. By the way, an original 1970s Star Wars book (Splinter of the Mind's Eye) had Luke and Leia (in hot and heavy we-don't-know-we're-siblings-yet mode) searching for a jewel that contains the force in great quantities, so it had been made manifest long before the prequels. I don't really have any opinion on the cries, added or otherwise. I agree the transition to evil was too quick. As for Greedo shooting first, I highly doubt I would have even noticed were it not for Kevin Smith making a big deal about it in his movies and writings. It pretty much escalated from there. Once it was pointed out to me, it did bother me. Lucas later tweaked it again so they both shot at the same time. When listing his failures, I'm surprised you didn't mention Howard the Duck. It's as common a target as Jar Jar Binks. For what it's worth, I don't think that movie is as bad as people make it out to be, either. No, it's not good, but it's not one of the worst movies ever made as it has been labelled. My pick for Lucas' biggest failures would be any and all changes he made to the original trilogy. I did buy the changed movies when they came to DVD and there were several shots that were so obviously out of place with the cgi that it distracted from the movie. (Although changing the alien singer in Jabba's place from an obvious puppet to cgi worked.) When he released the original movies untouched after swearing he wouldn't, that really pissed me off. I'm not buying Blu-rays of the movies until he releases the original trilogy untouched. By the way, the inserted Jabba scene you mentioned was actually a scene he had in the original Star Wars movie, but cut out because the human he had playing Jabba just didn't look right. I've seen the clip and it's a fat man dressed in something like furs and speaking with an accent. He took that scene and CGIed the Jabba as we know him over the human actor. So in a way, that scene was restored to the film, not inserted new. Chip, it's interesting that you mention the origins of the midi-chlorians. I wasn't familiar with that book and figured it was a newer idea. I didn't include Howard the Duck because I don't know as much about it. I know that it was a notorious flop, but it still pales in comparison to what happened with Star Wars for me. As far as making Han shoot first, I think it's just a perfect example of the pointless changes Lucas made. It's not just a new effect but changes an entire main character's personality. Han would never let Greedo take a shot at him. 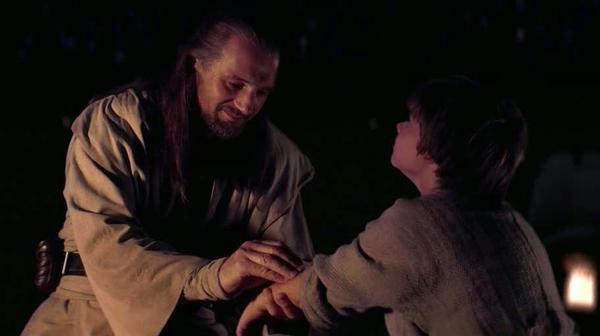 One clarification - Splinter of the Mind's Eye didn't mention midi-chlorians. It did define the force as something that was not just in humans, but in a physical object, too (the jewel). Can't argue with your placement, especially #1. Except to say that the prequels as a whole were a huge missed opportunity full of wasted storytelling and boring, lifeless characters. there is literally nothing revealed in them that shades or improves the original trilogy, nor are any real mysteries answered. instead they just seem silly, and diminish both Vader and the Emperor as villains and the might of the Empire in general. Joel, I can't argue with your point about the prequels. The mystery about the back story of Vader and the Emperor actually made them a lot more interesting and better villains. Beyond a few good effects and specific scenes, there was a whole lot of nothing in those movies. There's a reason that I haven't watched episodes II or III all the way through since the theaters. Nice list you got here. I'd added the Ewoks in ROTJ. The only change Lucas need to do in the original trilogy is to replace them with wookies. I have a soft spot for the Ewoks because ROTJ came out when I was a young kid. I expect that's the way some feel today about the Phantom Menace if they saw it at that age. I know they're irritating, but I'm okay with it. It has been a little while since I watched ROTJ, though. Spielberg does deserve some blame for "Crystal Skull," but he at least went on to make "War Horse," "Tintin," & (best of all) "Lincoln." So, in the end, Indy IV really didn't damage his legacy much. I agree. Indy IV seems more like an aberration than anything else. 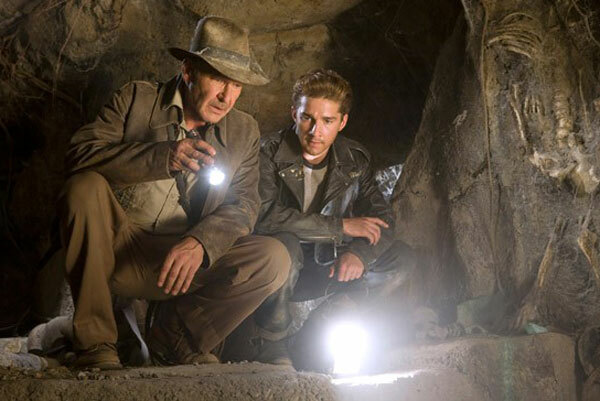 What's frustrating is the potential to do something really great that was wasted with Crystal Skull. While you may have not liked everything about the movies that Lucas made, he INVENTED those worlds and you should be grateful. Remember, those are HIS movies, not yours and you don't have to call him names online for all to see because there are elements you disliked. Becuase you did, I will add that I think you're all ungrateful immature weenies. You're probably still using your sippy cups. I think the fact that I am grateful as the reason that it's disappointing. People wouldn't care so much if they didn't love with Lucas created. I think what turns people off is how dismissive he is of the fans. Lucas didn't create the Star Wars phenomenon by himself. He collaborated with people like Lawrence Kasdan to make the films so great. I wrote this back in 2012 when he still owned the franchise, but his recent comments show that he doesn't understand an important fact - Star Wars doesn't belong to him anymore. He built something amazing, but being disappointed with what he's done since is any fan's right. I also don't think it helps your argument to resort to name calling. I don't think I call him any names in my post. I'm citing specific examples of what Lucas has done that I didn't like.